"To promote and extend library use, assist the librarian, and provide additional programming." Sponsor performers and artists for Summer Reading Programs. Provide books and materials for Story Hour sessions and assist when needed. Sponsor Book Bag Giveaways for Kindergarten Roundup each spring. Provide funding for all equipment in the library, any library furnishings and maintenance contracts. Assist Librarian when needed for shelving or other chores in the library. 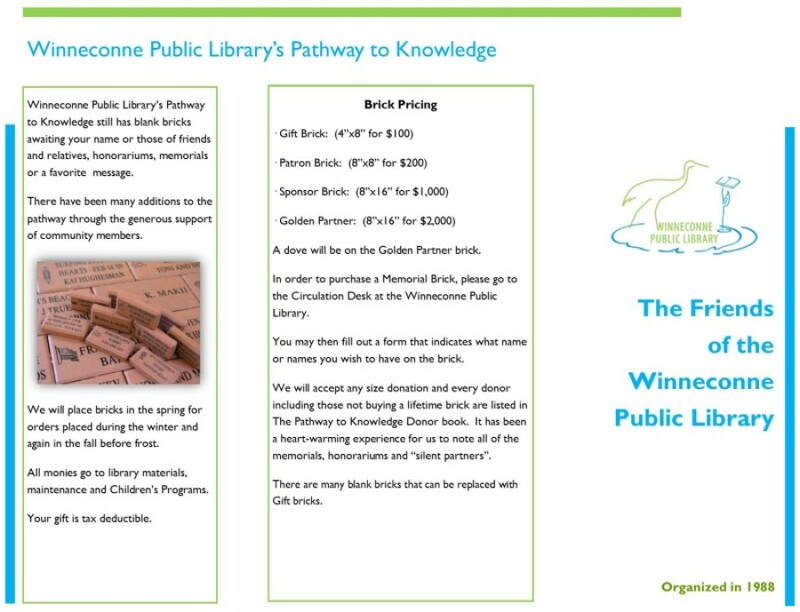 *Winneconne Public Library t-shirts and bookbags are on display at the library and cost $10 & $15 each. Opportunities abound for patrons and community members interested in offering volunteer services to the library. Some areas of interest include, but are not limited to, helping with Friends of the Library membership, publicity, and serving as an officer. Volunteers may also assist with story times, summer reading programs, monitoring programs, craft preparations, and more. Please call the library director for more information about volunteering at the library, 582-7091. 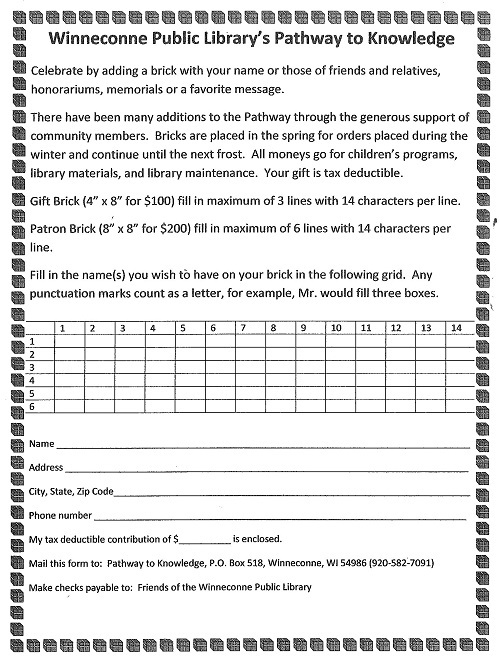 Annual dues in only $5.00 for adult; $4.00 for Senior and Student $20.00 organization. 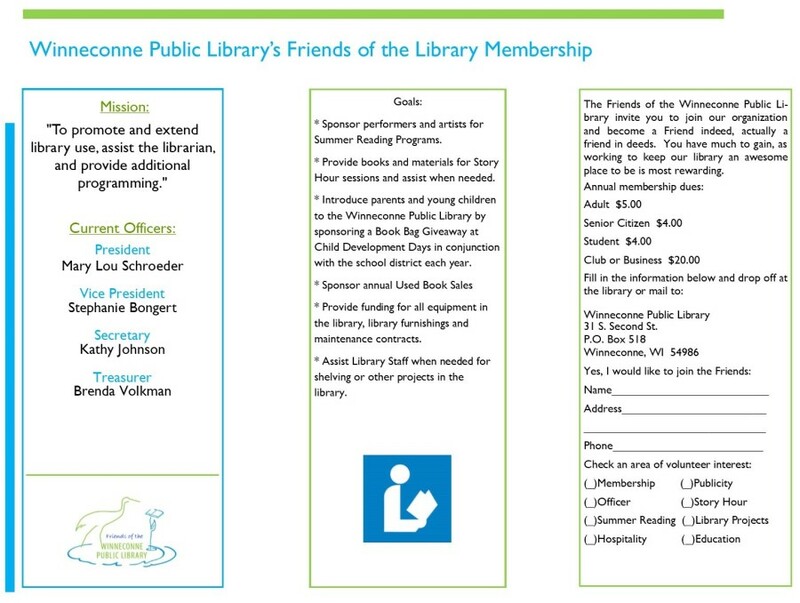 The Friends of the Winneconne Public Library will once again be hosting their annual Holiday Craft Faire! The Holiday Craft Faire will be held on Saturday, December 8th, in the Winneconne Middle School Gymnasium. 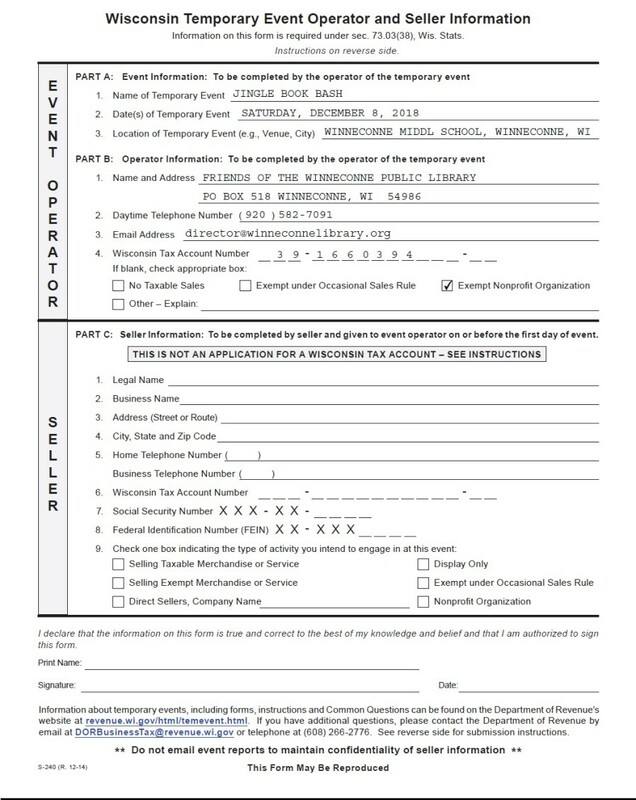 Please see tax forms and registration form needed to become a participant in the Holiday Craft Faire. 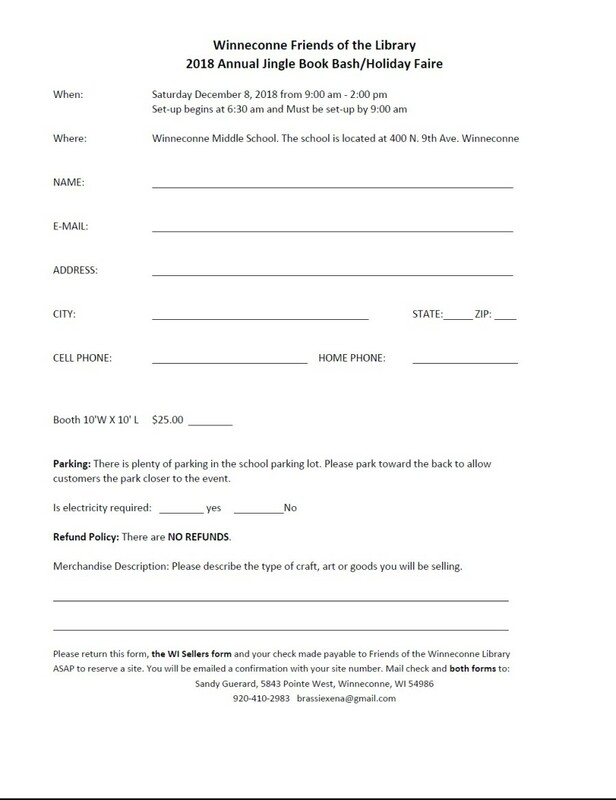 To reserve a site, fill out registration form, the WI Sellers form and include check made payable to: Friends of the Winneconne Library. 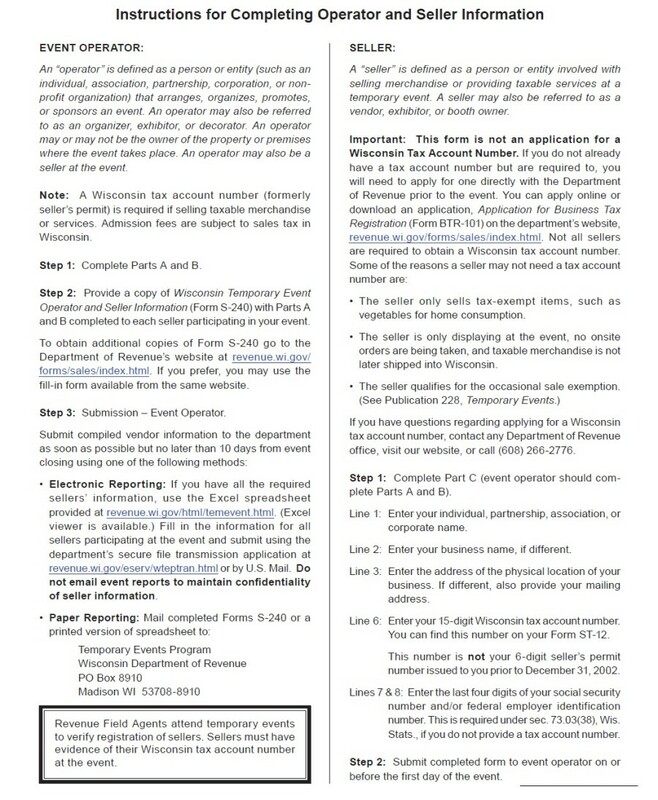 You will be emailed a confirmation with your site number.